There’s always a beer connection | LAGER FRENZY! Beer follows you everywhere once you’ve started to take an interest, and the past week’s holiday in Northern Jutland (Fjerritslev to be precise) was no exception. It didn’t take me long to spot that Fjerritslev has a nicely preserved brewery museum. The brewery was opened in 1887 by Peder Kjeldgaard and was run after his death by first his widow and then his daughter until 1982. Alongside its own beer, P Kjeldgaard also bottled for Carlsberg from 1885 to 1903. It was common practice in those days to ship the beer to the provinces in large oak casks to be bottled by local firms. Often the name of the bottlers shared the label with Carlsberg. The Danish road system wasn’t so well developed at that time and transport by tramp steamer was the fastest and easiest way to get goods around the country. I’m kicking myself now that I didn’t get to see the brewery, but looking through the information in the former farmhouse we were staying in I discovered that Peder Kjelgaard had grown up there. 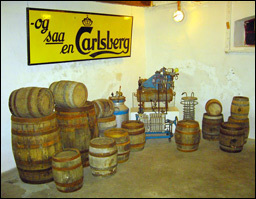 This entry was posted in Beer, Brewing history, Lager and tagged bottlers, Fjerritslev, Peder Kjeldgaard. Bookmark the permalink.